Benedict XVI begins a new series of reflections at today’s General Audience, devoted to prayer in the Acts of the Apostles and St. Paul. In expectation of Pentecost when the Church was born, Mary and the Apostles. "If there is no Church without Pentecost, there is no Pentecost without even the Mother of Jesus." Vatican City (AsiaNews) - " Prayer is often dictated by difficult situations, personal problems that lead us to turn to the Lord for light, comfort and help. Mary invites us to open the dimensions of our prayer, to turn to God not only in need and not just for ourselves but in a unanimous, persevering, faithful way with "one heart and mind". This is the first lesson in the new cycle of catechesis by Benedict XVI for the general audience, dedicated to prayer in the Acts of the Apostles and St. Paul. Speaking to the 20 thousand people present today in St. Peter's Square, the Pope was inspired by the writings of St.Luke, "the first book of church history", in short the Acts of the Apostles. Both in these and the Gospel there is a large place for the prayer of the apostles and the Virgin Mary. Before the "rapid spread of the Word of God into the East and West", Luke records the story of the Ascension , in which the Risen One " delivered to the disciples the program of their existence devoted to the evangelization." In Jerusalem, the Apostles, now Eleven after the betrayal of Judas, "are gathered in the house to pray, and it is in prayer that they await the promised gift of the Risen Christ, the Holy Spirit." " In this context of waiting, between Ascension and Pentecost, St. Luke mentions Mary, the Mother of Jesus, and her family for the last time." With Mary "the earthly life of Jesus begins and with Mary the first steps of the Church began, and at both moments the climate is one of listening to God in recollection." Mary "Mary followed her Son's journey throughout his public ministry and to the foot of the cross with discretion, and now continues to follow the Church's path with a silent prayer. At the Annunciation, in Nazareth, Mary received the Angel of God, she was attentive to his words, received and responded to his divine plan, expressing her complete openness". For his " inner attitude of listening, is capable of reading her own history, acknowledging with humility that it is the Lord to act. On a visit to her cousin Elizabeth, she breaks into a prayer of praise and joy, a celebration of divine grace" . In the Magnificat, " Mary does not just look at what God has done in her, but also to what he did and always does in history." "Even in the Upper Room in Jerusalem," in an atmosphere of listening and prayer, " is present, before the doors are thrown open and they begin to proclaim Christ the Lord to all nations, teaching to observe all that He had commanded". The stages of the journey of Mary, "from the house of Nazareth to Jerusalem, through the cross where her Son entrusts her to the apostle John, these stages of the journey of Mary are marked by the ability to maintain a persistent atmosphere of meditation, meditation on each event in the silence of her heart before God". "The presence of the Mother of God with the Eleven, after the Ascension, then is not just a historical record of a past thing, but takes on a meaning of great value, because she shares with them what is her most precious asset: her living memory of Jesus, in prayer and this mission of Jesus, preserving the memory of Jesus and thus also his presence". Between Ascension and Pentecost, "Between the Ascension of the Risen one and the first Christian Pentecost, the Apostles and the Church gather with Mary to wait with her for the gift of the Holy Spirit, without which one can not become witnesses. She who has already received it to generate the Incarnate Word, shares with the whole Church the expectation of the same gift, so that "Christ be formed" in the heart of every believer. If there is no Church without Pentecost, there is no Pentecost without the Mother of Jesus, because she lived in a unique way that which the Church experiences each day under the action of the Holy Spirit. " "To venerate the Mother of Jesus in the Church, then, means to learn from her to be a community that prays, that is one of the essential characteristics of the first description of the Christian community outlined in the Acts of the Apostles." 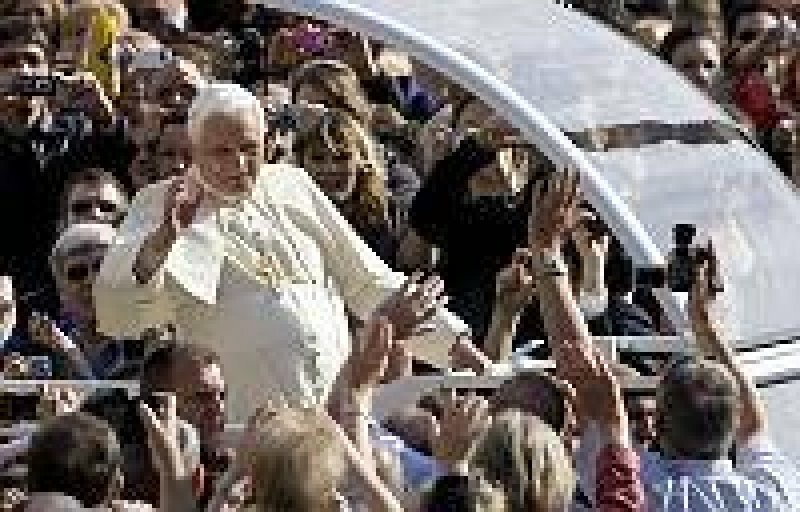 "Human life - concluded the Pope - passes through various stages of transition, often difficult and demanding, which require mandatory choices, sacrifices. The Mother of Jesus was placed by the Lord at the decisive moments of salvation history and has always been able to respond with full availability, the result of a deep relationship with God developed in assiduous and intense prayer. Between Good Friday and Easter Sunday, the Beloved disciple was entrusted to her, and with him the whole community of disciples (cf. Jn 19:26). Between Ascension and Pentecost, she is with and in the Church in prayer (cf. Acts 1.14). Mother of God and Mother of the Church, Mary exercises this motherhood until the end of history. We entrust to her every passing phase of our personal and ecclesial life, not least that of our final transit. Mary teaches us the necessity of prayer and shows us that only with a constant, intimate bond, full of love with her son can we emerge from "our house", by ourselves, with courage, to reach the ends of the world and proclaim everywhere the Lord Jesus, Saviour of the world"